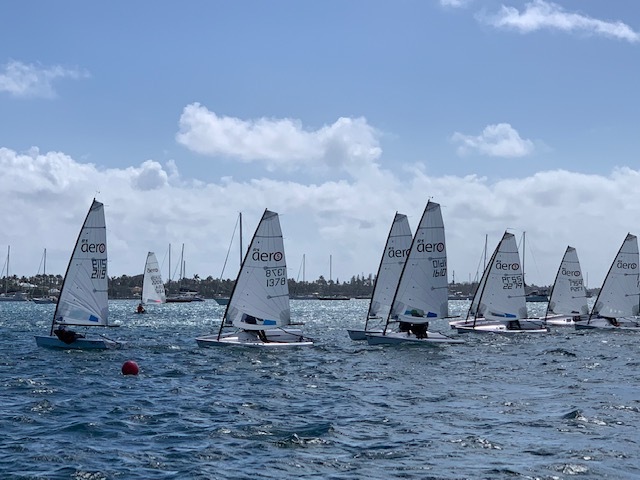 Ideal sailing conditions greeted the 24 RS Aero Midwinter racers who converged on Palm Beach this past weekend. The fleet raced on the ocean on Saturday in 15-20 knot winds and building seas that ranged from 3 to 6 feet, mixed with considerable chop. The challenging conditions added to the competitive racing over the four races run on Saturday. With a strong contingent of first timers in the RS Aero, the opportunity to sail on the ocean was a bonus. Returning after racing through the Palm Beach Inlet on a strong ebb tide and a swell made for exciting surfing into Lake Worth as well! Saturday evening a gourmet burger dinner was provided for the competitors by hosts, Palm Beach Sailing Club. co-hosts, Sailfish Club of Florida, provided an array of appetizers and the always popular rum punch. Smiles and laughs were evident amongst the old and new friends. 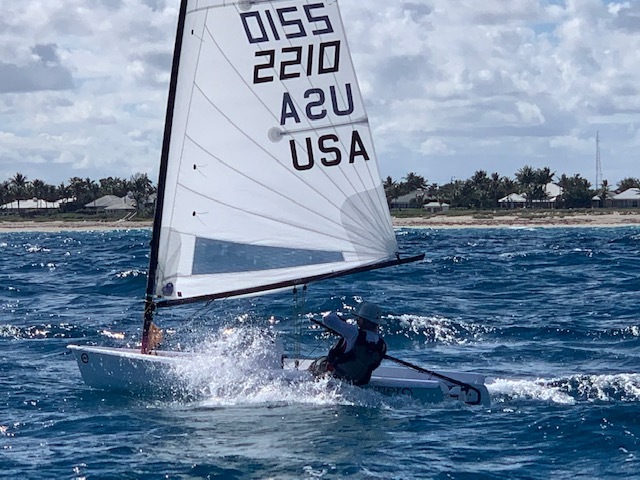 Sunday conditions were too rough to attempt offshore racing so the Harry Anderson course was set on Lake Worth with winds inside ranging from 12-18 knots. Four races were run on Sunday with lots of close quarters action at mark roundings, and tactics playing a significant role in how the competitors fared. A number of newbies in the 24-boat fleet made auspicious entries into the class. Eugene Schmitt from New Orleans looked very strong hiking and won the twelve boat RS Aero 7 class, followed by North American Class President Hank Saurage from Baton Rouge. Bill Dickey, a last-minute charterer from CT turned on the afterburners in Sunday's last two races to finish 3rd, just ahead of Bob Patterson, with another newbie, Lee J. Montes from NY finishing 5th. Jamie Gilman from RS Aero US Winter Series sponsor KO Sailing wasn't messing around, nabbing straight bullets in the nine boat RS Aero 5 class, including some very impressive port-tack starts. Regatta co-host Sailfish Club had three representatives in the top 5, with Paul Gingras in 2nd, Top Junior Nicholas Lorentzen in 3rd and John Brim in 4th. Top Female sailor Melissa Solnick from NY rounded out the top 5. In the RS Aero 9s, Mark Schwegman, originally from South Africa but now living in Ft Lauderdale, placed 2nd. Mark hadn't sailed a dinghy in 20 years but quickly took to the RS Aero, duking it out for the lead on a number of upwind legs with great speed and astute tactical decision making. Add a year of practice and this guy'll be scary fast! Madhavan Thirumalai finished 3rd, and receives the Furthest Traveled award, coming to the regatta from Bangalore India via San Francisco(!). Palm Beach is one of the few venues that provides the opportunity to sail both offshore on the Atlantic and on the Intracoastal Waterway giving sailors a full range of conditions in which to test their skills. and you can keep in touch with Everything Aero via the RS Aero North American Facebook Group . Video - Great 360 footage of RS Aero 9 World Champion, Marc Jacobi, at the recent RS Aero North American Midwinters 2019. Toggle around all the angles in every direction and up the sail. Just like you were sitting on his deck in the race alongside him! Day 1 was raced outside the inlet on the open ocean and the waves look wonderful! Day 2 was inside the inlet.